Just as workers are confronting the rapidly changing practices of the restructured, technological workplace and the increasing convergence of working and learning, so those involved in any form of workplace education or training are also restructuring their focus, teaching methods and approaches. This book examines the conceptual and practical challenges facing education and training professionals in redefining their contribution to improving communication and learning at work. Interweaving theory and commentary with actual case-studies, the book explores a multifaceted approach to workplace education which aims to develop individual workers' skills as well as integrating learning, language and cross-cultural issues into work, communication and management practices. It is a strategic, practical approach which draws on a range of applied linguistic and educational traditions and is informed by related disciplines such as cognitive and social psychology and organisational behaviour. The book does not present formulae for success; rather it illustrates the complexities and challenges faced by educators as they learn to balance different, and often conflicting priorities. 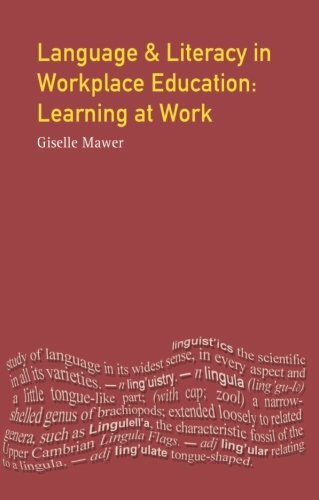 Language and Literacy in Workplace Education: Learning at Work has been written with a wide audience in mind, from language and literacy professionals, Human Resources staff, vocational trainers, managers, as well as students of education and linguistics. The book is clearly presented, and takes care to explain specific educational or organisational terminology making the study accessible to newcomers to the field.